Despite its name, Newburgh is very old. It was given its name in 1266 when it received a royal charter from King Alexander III. The nearby Lindores Abbey is even older. It was founded in 1191 by monks from Thiron, France, of the Tyronesian order started by St Bernard of Abbeville. 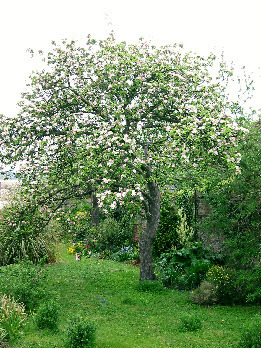 They developed the soil and planted fruit trees, to grow fruit for their own consumption, to make alcohol, to trade and to supply the Scottish royal court at Falfland. The orchard stretched along the hillside where Newburgh is now. Their fruit was famous throughout Scotland. Under the charter given by Alexander III, the abbey could divide the orchard into long narrow strips and allow ordinary people to live and work on them in exchange for a proportion of the crop. People would keep animals and grow vegetables under the trees. The abbey was closed by John Knox in 1580 and is now a ruin but these strips have been handed down through the generations as the gardens of Newburgh. They continue to produce wonderful crops of plums, pears, apples and other fruit to this day.